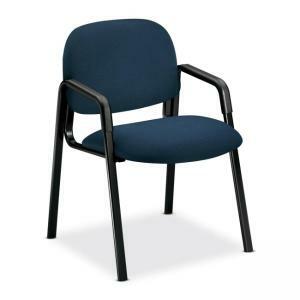 Guest chair with four-leg base and arms features a cushion design that provides lumbar support and helps eliminate fatigue. Painted, oval, steel frame has matching molded polypropylene armrests. Molded polymer outer back shell is color-coordinated with base. Seat size is 20" wide x 18" deep x 19-1/4" high from the floor. Usable seat depth is 18-1/4". Back measures 21" wide x 14" high from the seat. Distance between the arms is 18-3/4". Chair is available in black frame only. Certified by SCS to be in compliance with specific indoor air quality emission requirements. Meets or exceeds applicable ANSI/BIFMA standards.